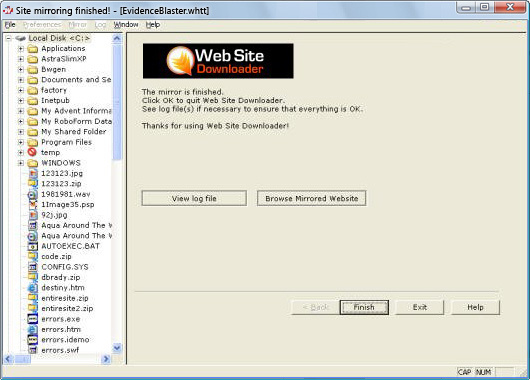 ..: Web Site Downloader Screenshots :.. World's Most Powerful Web Site Downloader! Viewing screenshots of an application helps you understand how it works. This page shows snapshots of Web Site Downloader doing what it does best - grabbing an entire Web site in seconds. Alternatively, you can watch a LIVE video demonstration of Web Site Downloader in action. To start off, you need to give this particular download project a name. Enter this on the first screen, and specify where you plan to save the files you download from your target site. Next, specify the URL of the Web site, or Web sites, that you wish to download. 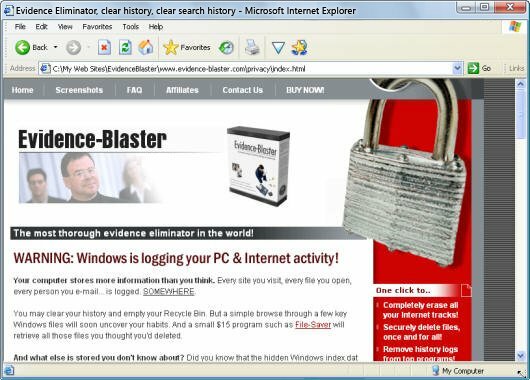 Here, we've specified that we wish to download the http://www.evidence-blaster.com/ site. You can also specify further options here if you wish, such as exactly which files to download and how deep to follow the links. Simply click "Next" to begin downloading multiple files from the site simultaneously. The entire directory structure of the site will be replicated on your hard disk. Just sit back and grab a coffee, as your files are transferred. If all went well, you should receive a report that the Web site has been successfully mirrored. Simply click on the button to browse the mirrored site. It'll open in your browser, running perfectly from your local hard disk -- without any need for an Internet connection! Interested? Click BELOW to get your copy of Web Site Downloader TODAY! DISCOVER, DINERS CLUB, EUROCARD, JCB, AND US/UK CHEQUES. OF $16.95, WHICH IS APPROXIMATELY £10.95 OR 12.95 Euros. Home | Screenshots | FAQ | Contact Us | Buy Now! © 2019 WCCL. All rights reserved.